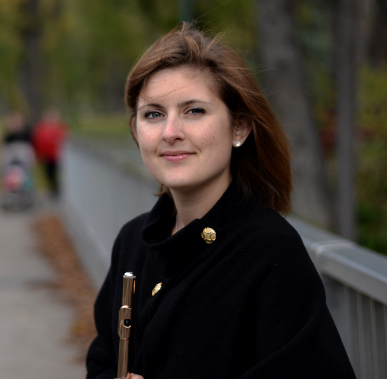 Originally from Russell, Manitoba, Charmaine holds a MMus in flute performance with a minor in piccolo from the Marcel A. Desautels Faculty of Music, University of Manitoba and University of Toronto. Charmaine also studied flute and piccolo at The Glenn Gould School of Music in Toronto, Ontario. Charmaine holds the piccolo & 1st flute position with the Winnipeg Wind Ensemble, directs and performs in the Wind Chamber Flute Orchestra, and is curator of her own chamber recital series featuring her two woodwind quintets, Canadian Bacon and the Hurrycane Quintet. Charmaine teaches flute and piccolo at her studio in the River Heights neighbourhood. She coaches flute sections for the Manitoba Honour Band and regional honour bands, and works with flute sections from Middle School to Highschool levels across the province. Charmaine has been an adjudicator at the Syrinx Flute Festival, and a masterclass clinician and adjudicator for the University of Manitoba Preparatory Division. She has been on staff at the Manitoba Conservatory of Music and Arts, the University of Manitoba Preparatory Division, a guest instructor at West Texas University’s ‘Big Fat Flute Shindig’, and served as interim Flute Choir director at the Canadian Mennonite University. Charmaine’s students have participated and enjoyed success in the Syrinx Flute Festival, the Manitoba Band Association’s festivals, Winnipeg Music Festival, and International Music Camp. Her students have played in the Winnipeg Junior Wind Ensemble, and as guests with the Winnipeg Wind Ensemble. Performance is an important focus in her studio teaching, as well as cultivating a fluency with the instrument so that students feel comfortable and confident in their day-to-day musical pursuits. Charmaine’s students have had a 100% success rate in being accepted to both the University of Manitoba Faculty of Music and the Brandon University Faculty of Music. Students have placed in all levels of the Manitoba Honour Bands, and excelled in their band programs. Charmaine is sought out for piccolo instruction and has worked with piccolo students from grade 6-and up. A classically trained pianist and organist, Charmaine is currently the choir pianist at First Mennonite Church under the direction of Yuri Klaz. Charmaine also plays for the Silver Notes Choir under the direction of Marilyn Mensforth, Margaret’s Choir under the direction of Nathan Poole, and Joie de Vivre with Dr. Stuart Sladden. She has previously held posts as organist and music director at Anglican churches in Toronto and Winnipeg.